Schlock-Wire: Severin Shocks You In August With THREE Barbara Steele Gothic Chillers – Schlockmania! With All-New Extras Plus TWO More Full Length Features Starring The Queen Of Horror! 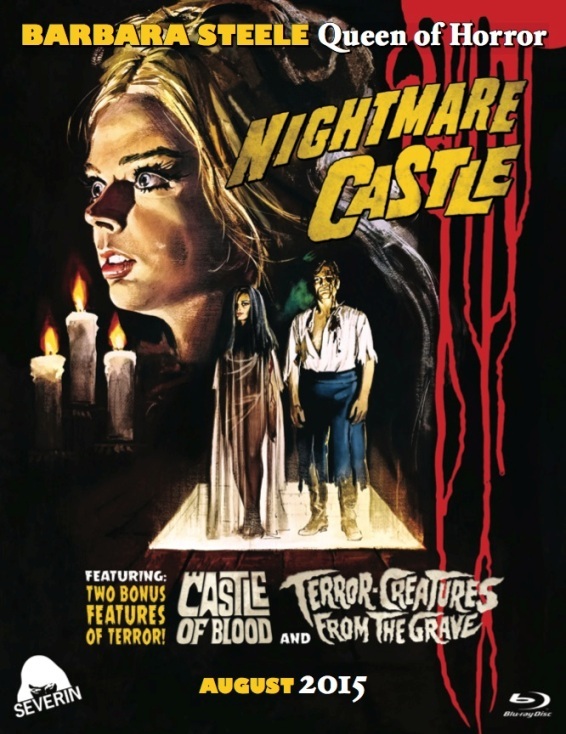 Los Angeles, 6/25/15 – Severin Films today announced the global Blu-Ray premiere of NIGHTMARE CASTLE starring the Queen of gothic horror, Barbara Steele (BLACK SUNDAY). The stunning HD presentation will be accompanied by an incredible array of extras including a brand new audio commentary with Ms. Steele and horror historian David Del Valle and the first HD presentations of TWO more classic Barbara Steele shockers — newly scanned in 2k from rare US release prints: Antonio Margheriti’s CASTLE OF BLOOD and Massimo Pupillo’s TERROR CREATURES FROM THE GRAVE. The release date for this deluxe package is set for August 18th, 2015. NIGHTMARE CASTLE: At the height of her career as the dark goddess of Italian horror, Steele delivered two of her most memorable performances in this tale of obsession, madness and depravity. Steele stars as a cheating wife who is chained, whipped and tortured to death by her sadistic scientist husband, and as her unstable blonde stepsister whose fate may be even more ghastly. Directed by Mario Caiano (NOSFERATU IN VENICE), featuring stunning black & white cinematography by Enzo Barboni (DJANGO) and the very first horror score by the legendary Ennio Morricone.